Upcoming Adventure Trips & Training Courses! If you’ve a choice between getting a backpack that’s a little too big, or a little too small, get one that’s a little too small. That way you’ll pack only what you really need and you’ll pack in a well organised fashion. No backpack is properly waterproof and backpack covers don’t work, so put a big lightweight dry-bag or a heavy duty plastic bin-bag inside your backpack, to keep your contents dry. Wear a tight’ish hat that pulls down well over your ears. A loose hat may blow off your head on a gusty day. It’s happened to me! For really cold days, or winter conditions, mittens are much better than gloves for keeping your hands and fingers toasty warm. When it’s really cold wear a pair of thin fleece gloves within your mittens. Get mittens with wrist straps, so when you take them off they’ll dangle from your wrists – one less thing to blow away. Practice doing tasks, like opening your zips or using a compass, with your mittens on; as this takes a bit of skill. Always, always, always carry a spare pair of gloves and a spare hat, buried deep and dry within your backpack! Don’t sweat! Start your day a little chilly as after ten mins walking you should have warmed up to a normal temperature. Avoid overheating and sweating, as this both dehydrates you and gets your base layers damp, meaning when you stop you’ll cool very quickly. Use your layers and zips to control your body temperature, also adjust your walking speed to cool down or warm up. Continually drink water throughout the day, even if you’re not thirsty. By the time you’re thirsty you’re already a little dehydrated. Also snack on your food throughout the day, to always keep your energy levels high. If you’re using a platypus and the temperature is cool, blow back the water in your platypus tube after taking a drink, in order to clear the tube, otherwise the water in your tube can freeze. Keep your mouth closed! On cold, snowy days breath through your nose instead of your mouth, as the cold dry air will crack your lips and dehydrate you; especially important on multi-day trips. Sun cream and lip protection are invaluable, both for sun burn and wind burn. Wear thermals and fleeces which are well fitted and long. Long thermals means you can tuck them well down into your trousers and they won’t ride up exposing and cooling your bare skin. Long fleeces won’t ride up your back as you’re hiking or stretching. All your fleeces and waterproof coat should have a draw cord at the bottom of them, which allows you to pull the bottom tight, preventing body heat escaping and rain seeping in. When it gets really bitter and cold tuck your thermal top into your underpants! Especially in serious conditions think several hours ahead and adjust your backpack contents and coat pocket contents accordingly. For example, when you stop for a break, if you think you'll need a spare fleece in an hour's time when you reach the cold windy summit then make sure it's at the very top of your bag. If it's going to get dark in two hours and you'll still be on the mountain have your head torch and food ready in your pockets; you don't want to be fumbling in the dusk looking for your torch. Don't let your feet get wet, if at all possible; by not stepping into streams, etc and also carrying plenty of spare socks. If your feet get sore when you stop for breaks take off your boots and socks for five mins to allow them to breath. Be careful though; you don't want to have a sock blown away or give your toes frostnip! Carry a pair of tight'ish sunglasses or cheap snow goggles with you. They've so many uses, from protecting your eyes from dazzling sun on snow, to allowing you to see against driving rain/hail mixed with wind. On bitter days they even keep that often exposed part of your face warm. 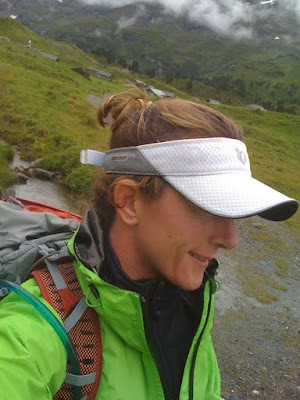 Wear a buff around your neck for full facial protection. What are your tips or suggestions? I'd love to hear them, just leave a comment below. Descending down from Carrauntoohil yesterday. -5 degrees on the summit, with the wind chill, and about six inches of snow in places. We came across Heavenly Gates, which involved a long, careful traverse. Dust off your wellies and wetsuits, it’s time to hit the great outdoors! Spring is in tantalizing reach and, like Outdoors Ireland, at Ooh.com we believe that the best sort of time is that spent outdoors. So we wanted to bring you a round-up of 5 of our favourite things going on in the great outdoors around the UK. First up, food foraging – an increasingly fashionable outdoors pastime that’ll soon have even celebs donning their wellies and picking up their secateurs and foraging baskets. And finally, it goes without saying that for kayaking, climbing and guided hikes and walks in Ireland, we’d always head to Nathan at Outdoors Ireland! If you're thinking of entering into your first adventure race, or just improving your technical skills, this training course in Kerry covers abseiling & rope work; map reading & navigation techniques; and also kayaking skills. The intensive weekend will be based in the Gap of Dunloe and the Lakes of Killarney, and is designed for all abilities, from complete beginner upwards. All equipment, qualified instructors and transport will be provided for you, plus a follow-up support forum to help you towards the final preparation for your race. The aim is for you to complete your training confident in the knowledge that you can safely use climbing equipment and abseil, including tackling a 50 metre abseil! You will be able to use a map and compass to navigate across the Irish hills. You will also learn kayak strokes, efficiency and self-rescues. We're running a weekend in Killarney, on 26th, 27th & 28th March, just for previous customers. It will be a discounted weekend, with a fantastic group of like-minded people and a range of exciting adventure activities to choose from. Based at Scotts Hotel, in Killarney Town Centre; luxurious accommodation, delicious food and lively entertainment will all be provided. If you're a local you can also skip the accommodation and just come and go for the activities and dinners! Doing as little or as much as you want, you can pick and choose from a relaxing afternoon's activities to an adrenaline filled three days of adventure! The team working with you over the weekend will include Ferghal O Grady, Darragh O Sullivan, Dave Roche, Tadhg Boyden and Nathan Kingerlee; some of whom you will have met over the past four years! This weekend is a thank you to our past customers and team. The price for the full weekend is €380 per person. The intensive weekend will be based in the Gap of Dunloe and the Lakes of Killarney, and is designed for all abilities, from complete beginner upwards. All equipment, qualified instructors and transport will be provided for you, plus a follow-up support forum to help you towards the final preparation for your race. The aim is for you to complete your training confident in the knowledge that you can safely use climbing equipment and abseil, including tackling a 50 metre abseil! You will be able to use a map and compass to navigate across the Irish hills. You will also learn kayak strokes, efficiency and self-rescues. Together with a dog and goat, Kerry mountaineer Nathan Kingerlee, has just returned from hiking the Blackwater Way, in search of the famous Irish welcome. ''The Irish welcome is alive and kicking'' says Nathan Kingerlee, who completed the 168km trek, from Shrone in Kerry to Clogheen in Tipperary, in six days. The way-marked path links together forest trails, country roads and hillside paths. It's one of 31 national way-marked long-distance trails, including the Beara Way and Kerry Way. Travelling about 25km a day, Kingerlee, Bob the goat and Cara the dog, stayed in farmhouse B&Bs along the way; where they received a warm welcome in the dusky evenings; the animals being given hay and a shed and Kingerlee being offered home-cooked dinners with the families and healthy picnic lunches the following morning for the day ahead. Keeping a daily blog on his website, www.outdoorsireland.com, Kingerlee was delighted with the welcome he received along the way, plus the occasional strange look as they strolled through some of the towns and villages. Bob the goat was borrowed from Cronin’s Yard Farm, a popular spot with hill walkers for beginning the climb of Carrauntoohil; while Cara the dog was Kingerlee’s own Springer Spaniel. After initial suspicion, both animals got on well together, even sharing the same small kennel on the final night. Asked what’s next, Kingerlee says that he plans to keep hiking, with Bob and Cara, all the way to Dublin, following the East Munster Way, the Leinster Way and eventually the Wicklow Way. He hopes to finish at Aras an Uachtarain and meet the president for tea, along with his goat and dog! Try something different this Valentine's Weekend! Relaxing afternoon kayak trip across Killarney Lakes - Saturday 13th. Beginning at 15th century Ross Castle, paddle into Lough Leane, discovering wooded islands and limestone caves. With an experienced, qualified guide learn the skills to master your boat and keep a look-out for white-tailed sea eagles as they soar above Killarney National Park. Climb Ireland's highest mountain, Carrauntoohil - Sunday 14th. From Carrauntoohil's peak savour breathtaking views over the Iveragh, Beara and Dingle Peninsulas, as far as Skellig Michael and the Blasket Islands. Discover legends and local history with an experienced, knowledgeable guide. One Night's Bed & Breakfast: €55 per person sharing. Two Nights Bed & Breakfast plus One Dinner in the Courtyard Restaurant: €119 per person sharing. Also check out Killarney Railway Hostel, conveniently located beside the Train Station, with private rooms and continental breakfast. I'm looking for single men, between the age of 26 and 40 to participate in our next Singles Adventure Weekend! We're fully booked with females, but have a few more places left for males. Spend an adventurous weekend with fun, like-minded people; delicious food; luxurious accommodation; excitement and great craic. It will be a fantastic opportunity to meet similar-minded people in a relaxed and fun setting, while hiking Kerry hills, kayaking across lakes, climbing sandstone cliffs, experiencing a night walk and plenty of other surprises! Don't worry if it all sounds too strenuous... This weekend will be suitable for all levels, from beginner upwards. There will also be plenty of relaxing; healthy food and the occasional pint! Based in Killarney, at the luxurious Randles Court Hotel, the weekend will begin with arrival on Friday evening, followed by a night walk through Killarney National Park, with the option of a pint before bed! Saturday evening will be spent relaxing and chatting over dinner and the weekend will finish on Sunday afternoon at approx 430pm. All transport, food and equipment will be provided. There will be a 50/50 split of males and females. The age profile will be 26 - 40. Weekend will begin on Fri evening with arrival between 7pm and 8pm. Saturday; last day on the road; grass stiffened white with frost, thin ice in the puddles, my route took me across Crow Hill, then the Knockmealdown Mountains. From near Knockclugga the sea at Dungarvan came into view and here the distance of the journey we'd taken struck me - to leave views of the Atlantic and six days later to come into view of the Irish Sea... I lingered on this cold, high mountain pass for a little while, before descending towards the main road. At the top of the road pass stood two stone huts, used in coach road days to water and rest tired horses, after their hard uphill climb. About 4pm we emerged out of pine and walked the final short distance into Clogheen, where I'd promised myself an eagerly awaited pint. Later that night, with a couple of friends, we tucked into bacon and cabbage and plates of chips. 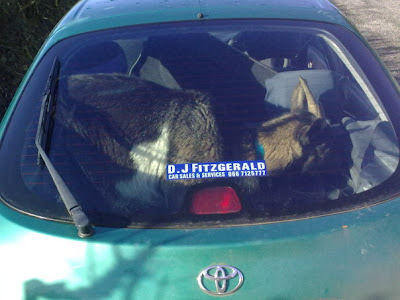 Sunday morning, three men, a dog and a goat squeezed into a little green car for the trip back to Kerry, whizzing past the mountains, woods and valleys that I'd spent the past six days navigating through. The Irish welcome is without a doubt alive and kicking! Both the people I met along my journey and the country I passed through were what made it an memorable and brilliant experience. The things I'll remember along the way are drinking tea and eating ham sandwiches with Dan Joe on his farm near Millstreet; picking my way along the Blackwater to the nuns at the Nano Nagle Centre, where I was fed with soda bread and jam. Forest tracks and green roads over Kilworth Mountains; freshly home-baked currant cake and apple tart at Tom and Mary's home, near Araglin; the helpfulness and flexibility of the B&Bs and finally the invaluable support of Christy Roach - who volunteers his time to up-keeping and developing a major part of the Blackwater Way. The support from the B&Bs along the way, both to myself and all hikers, is excellent. They provide transfers from the hike to their B&B, and back again in the morning; home cooked meals, or a drive to the local pub; picnic lunches to set you on your way. Most of all though I need to thank John and Ester from Cronins Yard, for trusting me with Bob. Cronins Yard is the starting point for climbing Carrauntoohil, just outside Killarney. You'll find car parking, a coffee shop, toilets and showers, plus maps and books for sale. If you are climbing Carrauntoohil, or in the MacGillycuddy Reeks, this is an excellent place to start. One of the reasons I did this is to raise money for Kerry Mountain Rescue.